10 K Artworks have been viewed 10,057 times. 24 Artworks have been added to favourites 24 times. 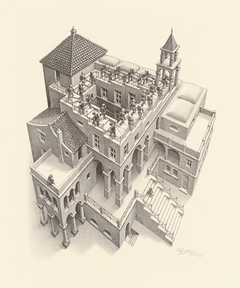 Maurits Cornelis Escher (1898-1972) is most famous for his so-called impossible constructions; he played with architecture, perspective and impossible spaces. During his lifetime, he made 448 lithographs, woodcuts and wood engravings and over 2000 drawings and sketches. 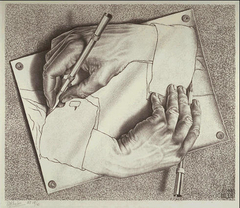 Apart from being a graphic artist, M.C. 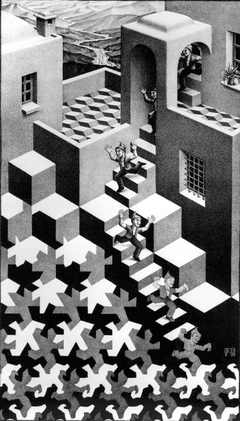 Escher illustrated books, designed tapestries, postage stamps and murals. He was born in Leeuwarden, the Netherlands, as the fourth and youngest son of a civil engineer. 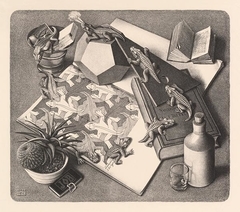 After 5 years the family moved to Arnhem where Escher spent most of his youth. After failing his high school exams, Maurits ultimately was enrolled in the School for Architecture and Decorative Arts in Haarlem. 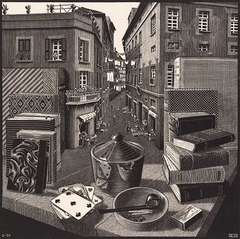 After only one week, he informed his father that he would rather study graphic art instead of architecture, as he had shown his drawings and linoleum cuts to his graphic teacher Samuel Jessurun de Mesquita, who encouraged him to continue with graphic arts. M.C. 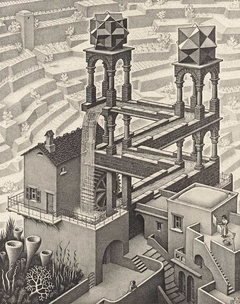 Escher became fascinated by the regular Division of the Plane, when he first visited the Alhambra, a fourteen century Moorish castle in Granada, Spain in 1922. During the years in Switzerland and throughout the Second World War, he vigorously pursued his hobby, by drawing 62 of the total of 137 Regular Division Drawings he would make in his lifetime. 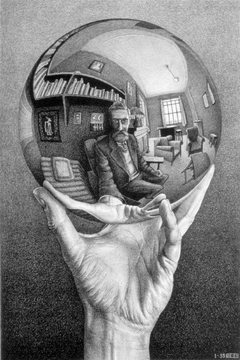 He would extend his passion for the Regular Division of the Plane, by using some of his drawings as the basis for yet another hobby, carving beech wood spheres.